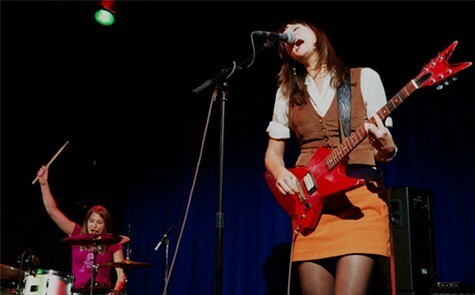 Amanda Schukle and Tracy Shapiro are Oakland rock duo Steel Cranes. With Schukle on drums and Shapiro on vocals, the two are rumbling the Bay Area music scene with their raw vibes. After knowing each other for only about a year and a half, the two are preparing to release a debut album entitled Ouroboros. We have the honor of premiering their first single, “Boat Song,” a hefty, droning five minutes of noise and lamentation. The two women exude a fervent-yet-slow, seeping energy into this song, which they say they recorded in one take. Set on maintaining the roughness of their live performances, the pair insisted on putting the whole album on tape. To do so, they teamed up with engineer Eli Crews of New, Improved Recording who has worked previously with tUnE-yArDs, Deerhoof and Questlove. Ouroboros is scheduled for release on September 24th. Amanda Schukle (left) and Tracy Shapiro (right). Oakland’s bossanova dream-pop band Trails and Ways released its EP Trilingual earlier this month, and their first single, “Como te Vas,” is a perfect summer tune. While staying faithful to their established sound, they are more unabashedly fun-in-the-sun than ever before. With touches of clapping and snapping, the song seems to allude to a far-away dance party. Heavily influenced by time spent in Brazil and Spain, they have even called their sound “emigration dream-pop.” This song will definitely take you across borders. Look out for a full album review coming along soon. San Francisco-based experimental producer Chris Dexter, better known as oOoOO, just released his debut album Without Your Love. Although he’s been releasing EPs and mixes of ethereal electronic for a while now, this is his first full-length album, and he decided to release it on his own label, Nihjgt Feelings. The first single off the album, “Stay Here” is intensly gloomy and affecting. His sounds seem to creep around the auto-tuned vocals like fog over the city at night. The effect is haunting and incandescent. Look forward to a full album review soon. Meanwhile, check out this interview with oOoOO in The Skinny for some of the artist’s pesimistic thoughts. Originally from San Francisco, psychedelic post-punk trio Weekend, is set to release their second album, Jinx, on July 23rd. Their second single off their album, “It’s Alright,” is raw, heavy and mournful. Although the reverb is still there, “It’s Alright” and Jinx’s first single, “Mirror” seem to point to a mildly cleaner version of the band’s original, lo-fi sound. Regardless of their direction, their execution of this album so far is on point.